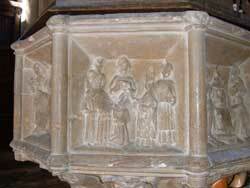 One of the first things you will see as you come into the priory is the font. It is not at the west end of the church because that is a convenient place to stick it – or because putting flowers on top makes it looks nice from the other end! The whole church is designed to reflect our pilgrimage to God. At the east end is the altar, where Holy Communion is celebrated – where we receive the Body and Blood of Christ and we become inextricably linked with his life as he is with ours. 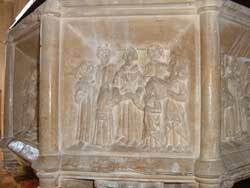 We begin our pilgrimage at the gate of the church outside, and slowly draw closer to him and his altar. However appealing the architecture, it is our decision whether we want to walk through the gate or not; walk down the path and into the porch, through the next door and into God’s house – and we are presented with the font. This is where Baptism takes place. Baptism is a joyful service involving a public declaration of faith and of commitment to God. It offers us a way of entering the fellowship of the Church and of taking another step on our continual journey towards a closer relationship with God. 1. We understand and accept what God the Father has done for us through Christ, and embrace the promise of a new life in the Spirit that He offers to us. 2. We willingly confess publicly our commitment to Jesus and our willingness to follow Him. 3. We show our desire to turn away from our old life of sin and to enter into the new life that Christ offers by being baptised in the name of the Father, the Son and the Holy Spirit. 4. 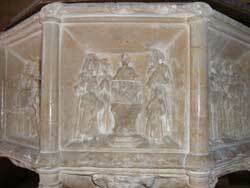 By taking part in Holy Communion (also known as the Eucharist, the Mass, or the Lord’s Supper), the family meal which Christ instituted for His followers. At this meal we recall what He did for us on the cross, are fed spiritually by Him as we receive His body and blood through the bread and wine, grow in unity with Him and all those who belong to Him, and look forward to being with Him for ever in God’s new creation. What is special about this particular font? 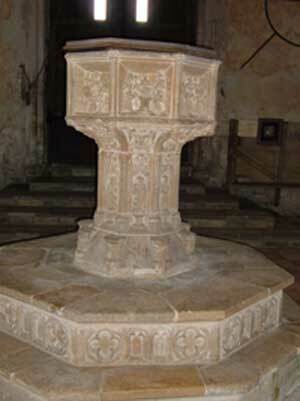 The font is perpendicular – 15th century – and has eight sides. 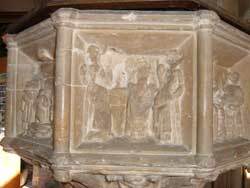 It is known as a Seven Sacrament font because of the carvings around the bowl, each one of which illustrates one of the sacraments of the church. This is a particularly East Anglian design and none are known elsewhere; there are 16 in Norfolk and 12 in Suffolk remaining. 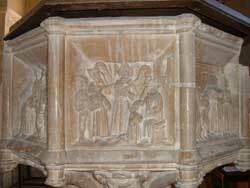 Of course there are seven sacraments and an eight-sided font, so the mason and donor had to decide how to fill the last panel; in Binham they have added the Baptism of Christ though in some other churches (e.g. 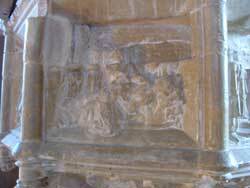 Norwich Cathedral) you will find a representation of the crucifixion. The font was mutilated by having the faces of everyone portrayed hacked away. This probably occured during the Commonwealth (rather than the reformation) when the puritans were in power. 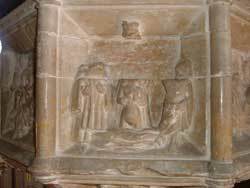 They believed that any representation of God, angels or saints – even common people – smacked of idolatry, so they smashed carvings on fonts, walls, statues, the medieval stained glass in the windows – even the faces of donors on the benchends of the pews. 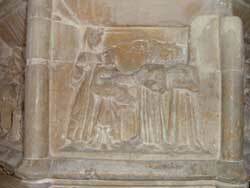 The sculptural panels are of the Seven Sacraments; the 8th panel is of the Baptism of Christ. Some colour can still be seen in the deepest folds of the sculpture.